Madonna does a terrible imitation of the Cincetta goddesses and as an Italian myself this does not surprise me- you have to be NATURAL. 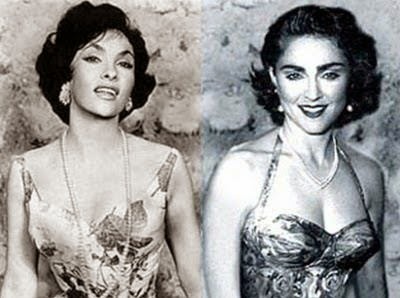 Madonna lacks the natural lushness of the 1950s Italian Goddesses and is more of a precursor to Jersey Shore. She was at least not stupid enough to attempt Sophia Loren whom, as with La Lollo and Claudia Cardinale, physically and talent wise she is the complete opposite of in every way. Not a style exclusive to Gina Lollobrigida. But to the 50's.